The Pyrite Resolution Board (PRB) takes your privacy very seriously. This Privacy Notice details how we collect, use and securely store any personal data submitted to us through use of our website [our site]. This document also contains an overview of the various rights you can exercise as a data subject, as well how you can exercise those rights. Please read the following carefully to understand our use of your personal data whilst using our site. The scheme exists for the remediation of damage to certain dwellings caused by pyritic heave and to oversee the effective implementation of a programme of remediation works for affected dwellings. We are a non-departmental body under the aegis of the Department of Housing, Planning and Local Government. We work closely with our colleagues in the Housing Agency to ensure the delivery of the Pyrite Remediation Scheme. We are subject to all data protection regulations and legislation, including The General Data Protection Regulation (EU) 2016/679 (GDPR) and the Data Protection Act 2018. We work to act in a fully accountable and transparent way. 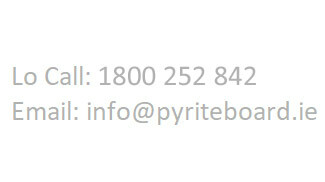 In order to carry out its function of administering the Pyrite Remediation Scheme, the Pyrite Resolution Board receives personal data from applicants to the Scheme. The personal data (except your PPSN) is shared with the Housing Agency for the purpose of processing applications and implementation of remediation work. ‘Personal data’ under the applicable data protection law (Regulation EU 2016/679 (GDPR) and the Data Protection Act 2018) means any information about an individual from which that person can be identified. You can use our site without being required to provide any personal data to us. In cases of apartment developments where a Ground Floor Common Area Application Form is completed by the applicant (owner or authorised management agent), data held includes the applicant’s name, contact address, address of the property that is the subject of the application, contact phone number and email address. Any personal information we collect will not be kept for any longer than it is necessary to provide the specific service. The length of the retention period depends on how long we need to process your data. In certain circumstances we are legally obliged to retain personal information for longer, such as accounting or regulatory purposes. In principle, we do not share your information with anyone outside the PRB without your express permission or unless required by law, and under no circumstances will your information be sold or passed on to third-parties for the purposes of marketing, sales or other commercial uses without your prior express consent. For the purposes of the prevention and/or the detection of fraud or crime. We also may disclose your personal data to third parties who provide a service to us who are bound by a statutory duty of confidentiality. The transmission of information via the Internet is never 100% secure, however we have taken appropriate information security measures we believe will safeguard any information you submit to us. You may request to exercise any of these rights, free of charge by completing the Subject Access Request Form and submitting it to the contact email or postal addresses below. In order to assist you with the following requests, we may request proof of identification to verify your identity. Any identification collected by the PRB during this process will be immediately destroyed upon verification of identity. Once your identity is verified, we will respond to your request within one month. That period may be extended by two further months where necessary, taking into account the complexity and number of requests submitted. We will inform you of any such extension within one month of receipt of your request. We have the right to refuse your request for the reasons set out above, or if it is manifestly unfounded or excessive, or to the extent necessary for important objectives of public interest. The PRB has appointed Trilateral Research (www.trilateralresearch.com) as the external, statutory Data Protection Officer (DPO) for the Pyrite Resolution Board. Should you need to contact the DPO directly, you can do so either by phone or by email. The DPO will respond to you as soon as possible. Please send your enquiries and requests to exercise your rights to one of the following addresses. Our DPO is also available to provide any clarification. Under Article 77 GDPR, you have the right to lodge a complaint with the Data Protection Commission if you consider that processing of your personal data does not comply with the applicable data protection legislation. Under Article 80 GDPR, you may authorise certain third parties to make a complaint on your behalf. The DPC can be contacted at the following address: www.dataprotection.ie. We reserve the right to change this Privacy Notice from time to time at our discretion. If we make any changes, we will post those changes here and update the ‘Last Updated’ date at the bottom of this Privacy Notice. However, if we make material changes to this Privacy Notice, we will notify you by means of a prominent notice on our site prior to the change becoming effective. Please review this Privacy Notice periodically for updates.